Divan is a public space intervention in Bucharest's park IOR (Titan) made by the artist Virgil Scripcariu in 2010 with the shape of a cat-sofa. 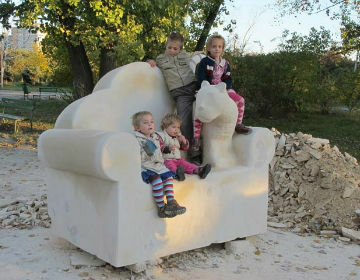 Locals in Bucharest have reviewd Divan - Monuments in Bucharest. You can get here description, reviews, address, map, phone, website of Divan in Bucharest. Visit Bucharest Tips for more Monuments in Bucharest!